As Featured in Grassroots Motorsports! As Featured in Nissan Performance Magazine! ...and again in Nissan Performance Magazine...! 27 September - Ummm, yeeeah. 'Bout those updates...yeeah...well, yes, I've been ignoring you. It's not because I don't like you...well, you know, it's not YOU, it's ME....really! 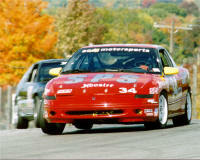 After visiting Road America in 2009 as a spectator, I decided I wanted to race that track. And I decided if I was going to make that long tow, it was going to be for an event, not just a regular ole race weekend. And what better "event" than the SCCA Runoffs...? And, given that the new STU class was made a National class, and Improved Touring cars are explicitly legal for STU, and all it took to qualify to the Runoffs was four race finishes, how could I refuse? So 2010 became "The Year of STU". We opened the year at NHMS with the School/Regional, where I was an on-track instructor for two days, then a racer for two days. I managed to start the year with a win in STU in the Integra, and things looked to be falling into place. I spent the rest of the year with the goal of four National race finishes; I got that with one at Lime Rock, a double finish at Watkins Glen, and one other finish at Pocono. As the year went along the Integra became less ITS and more STU. Once Matt realized I was racing STU this year the first thing he did was walk over to the car, casually open the hood, tinker with some tools for a few minutes, then emerge with the IT-required washer bottle. He then hurled that washer bottle across the shop into the back wall, where it dropped to the ground and I think it still lies today...Once that emotional hurdle was reached, we decided to move more and more away from IT-legal stuff while still remaining IT-reversible. Some of those mods included rear adjustable to links (to make rear toe adjustments scads easier), rear adjustable upper control arms (to make rear camber adjustments simply possible), front upper control arms (to make front camber adjustable), and of course we removed the IT-required 100# ballast. Finally, a poor result at Watkins Glen illustrated that we needed serious transaxle work, and by the time we added up all the parts the trans needed we recognized we could buy a brandy-new Type-R close-ratio trans from Honda. So we did the latter, adding in a 4.7 final drive and an OS Giken limited slip diff. Oh, and we got ahold of a set of German Accord 2-piston calipers that use much larger Legend rotors (redrilled, from Fastbrakes) and Type-R pads, so we tossed those on, too. Other than that, the car is still IT-legal. Of course, we had no expectation of world dominance in this class; the competition is just too strong (this is a class for World Challenge cars). But we got our four finishes, "qualified" for the Runoffs, and I went thee and drove the track. And it was a fun time. Oh, and by the time you read this Jeff Lawton has probably, finally, won the NARRC championship. But since he doesn't give me any racer reports I'm not going to mention that. Greg writes: I'm labeling 2010 "Transitions". Everyone is in some state of transition: Jeremy with a new son, Jeff with some other life changes, Joe has disappeared, Matt is working hard to build the business, and I had a minimal 2009 season that allowed me to see what it's like to have actual cash in my checking account. I suspect the lot of of are feeling a bit fatigued by racing; not so much that we dislike it or want to quit, but enough to where we're gonna get a bit more picky. The Integra build is coming along nicely; we expect to attend the National at NHMS in early April to compete in STU. 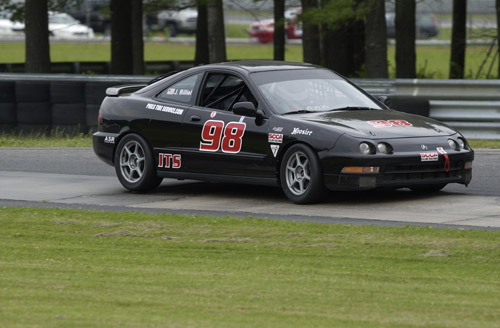 I've actually set a goal for myself to attend the 2010 SCCA Runoffs; though I recognize the I.T. 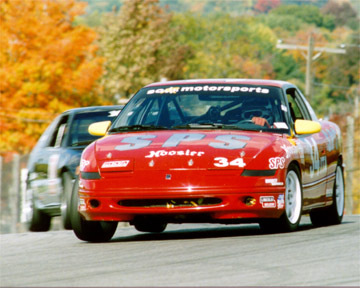 car won't be competitive in a good STU field, I've always wanted to run Road America (yup, believe it or not, never have in a quarter-century of racing.) And if I'm going to make that long tow, it's going to be for a premier event. The Miata project has not progressed at all, primarily due to priorities (that being the Integra) in both time and money. However, I am in discussion with another potential partner in the car, and if we come to agreement then NER will get a nice surprise... With the recent changes with the ITAC and effective commandments from the CRB, I'm am fully convinced that a well-built 1.8L Miata in the right hands will wipe up ITA; the car is that good. I suspect we'll see more in that regard in 2010.